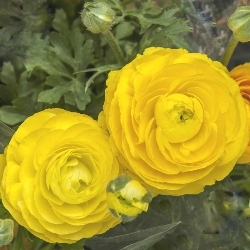 Also knows as Persian Buttercups, Ranunculus look great just about anywhere in the garden, bringing brightness when planted among low-growing shrubs, annuals or perennials. Be sure to plant with the claws pointing downwards and water well after planting. Removing the faded flowers from time to time during the blooming period will encourage them to keep blooming. These are also excellent cut flowers...cut them when the blooms are in bud, not when they are fully flowered. 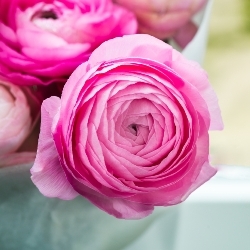 Stunning colors and strong stems make Ranunculus excellent cut flowers. They are most popular in the mild-winter regions of the South and West, in states such as California, Nevada, Arizona, New Mexico, Texas, and Louisiana – Zones 8 through 11, where they grow best. Planted there in October or November, they flower in March. This item ships in Fall. 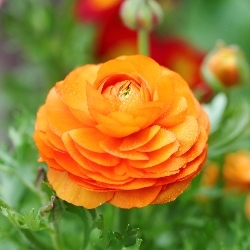 To order Spring Planted Ranunculus please see: http://www.marysgardenpatch.com/Ranunculus-(Spring).